Grade I astrocytomas: Most are located in the cerebellum. These tumors are well delimited of brain tissue, most of them with cysts, and they grow very slowly. Subependymomas: These are typically found in the fourth ventricle directly under its floor (10). They are considered to be very benign, graded I on the W.H.O. 4-point scale. Grade II astrocytomas: The most common type is fibrillary astrocytoma followed by gemistocytic astrocytoma (5), which may become malignant. The most infrequent type is the protoplasmic astrocytoma. The most common genetic alteration is a mutation in the TPV3 tumor suppressor gene at 17p13,1 (6). These tumors also grow very slowly, but they can infiltrate normal tissue making their margins unclear. 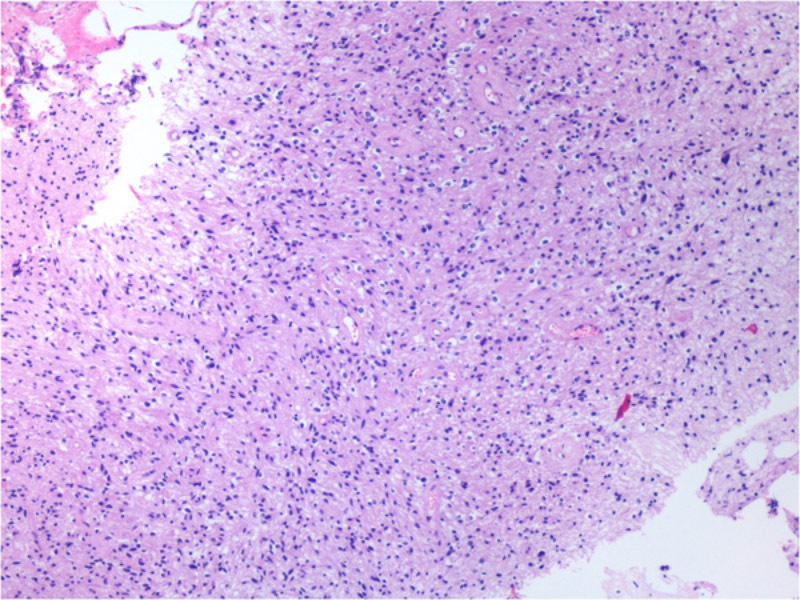 Subependymal giant cell astrocytomas: These astrocytomas appear in 6–16% of patients with tuberous sclerosis. They are generally localized at the foramen of Monro. They are very similar in behavior to grade I astrocytomas, although most of them are solid. 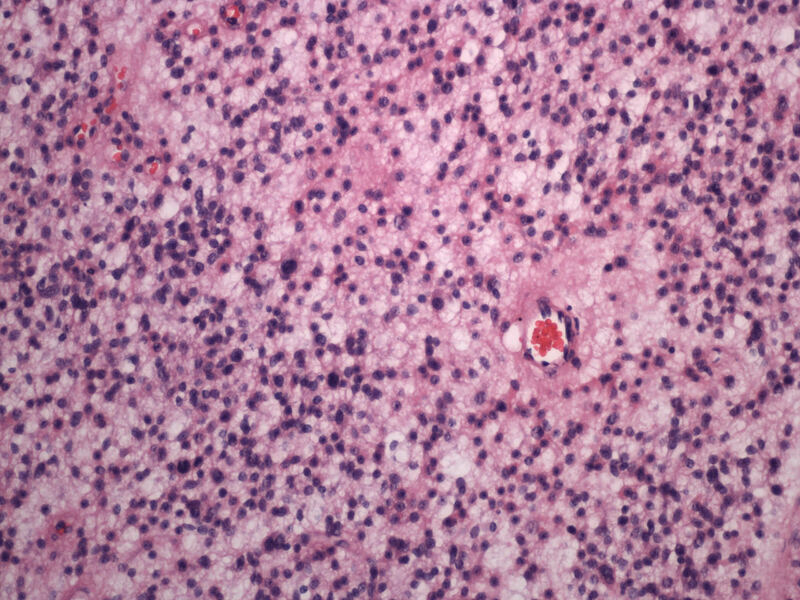 Pleomorphic xanthoastrocytomas: They generally occur in individuals younger than 20 years of age. Because they are normally located in the temporal lobe of the cerebral cortex, seizures are usually the first symptom. Pilocytic astrocytomas: The BRAF gene (7q34) has been linked to pilocytic astrocytomas and it is responsible for the activation of the ERK/MAPK pathway. Diffuse (grade II) astrocytomas: 60% will have a mutation of the P53 gene with the mutation frequently being a LOH at 17p (31). Oligodendrogliomas: The most common finding in oligodendroglioma is the co-deletion of 1p and 19q alleles, being present in more than 80% and 70% of cases, respectively (24, 25). The tumors showing these deletions are more chemosensitive, with a resultant improved prognosis. Pilocytic or grade I astrocytomas: These tumors are very well delimited and have low cellularity with areas of compact bipolar cells and areas with microcysts with multipolar cells. Rosenthal fibers and grainy eosinophilic bodies can also be found. Neurofibromatosis type I is a common association. JPA – H&E Stain: Photomicrograph of a JPA showing numerous microcysts and relatively low cellularity with cells being uniform in nature. Rare Rosenthal fibers are present. 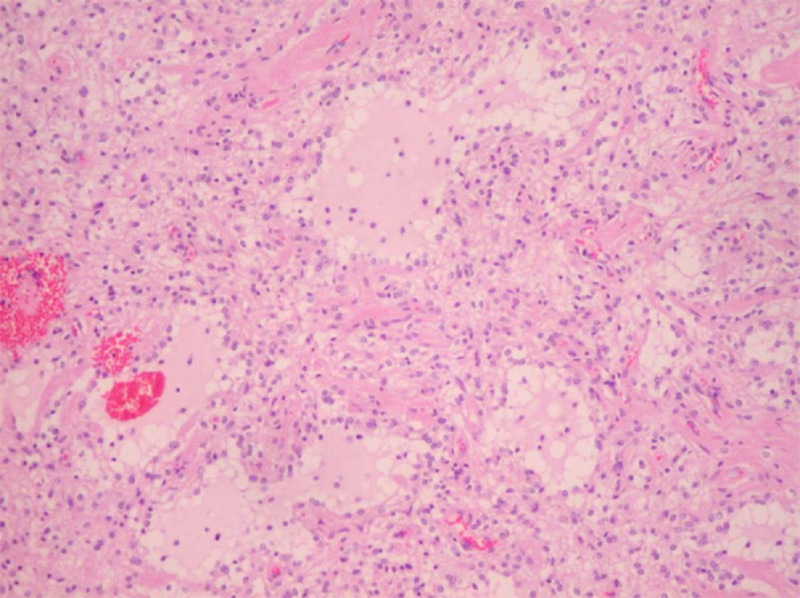 Diffuse astrocytomas: These tumors stain positively with gliofibrillary acid protein (GFAP) and protein S100. 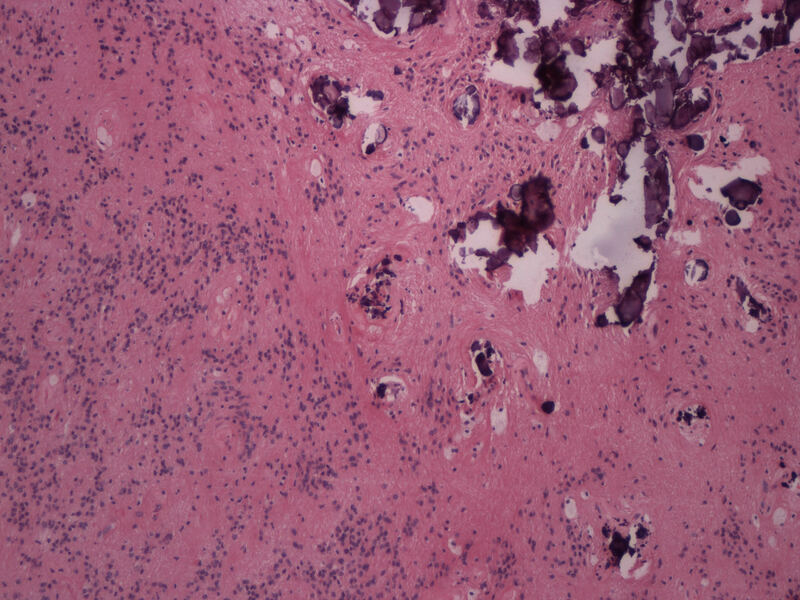 Fibrillary Astrocytoma – H&E stain: Photomicrograph of a diffuse low-grade astrocytoma showing more cellularity than a JPA but individual cells are relatively uniform and there is no sign of vascular proliferation or necrosis. Fried egg appearance: These tumors are usually monomorphous with moderate cellularity and slow growth. Histologically, the cells somewhat resemble a fried egg with a round or oval nucleus and a perinuclear halo. Microcalcifications and cystic mucoid degeneration are also typical of these tumors. Oligodendroglioma, W.H.O. grade II : H&E stain, 200X magnification. Mixed histology of astrocytoma and oligodendroglioma: These tumors are composed of two neoplastic cell types reminiscent of diffuse astrocytomas and oligodendrogliomas and may be diffusely mixed or separate. However, there is always moderate cellularity and low mitotic activity. Mixed oligodendroglioma, W.H.O. grade II: H&E stain, 200X magnification. Pseudorosettes, microcystic degeneration, and fibrous network: These tumors are composed of uniform soft cells within a dense network of glial fibers. They usually present with perivascular pseudorosettes and microcystic degeneration. 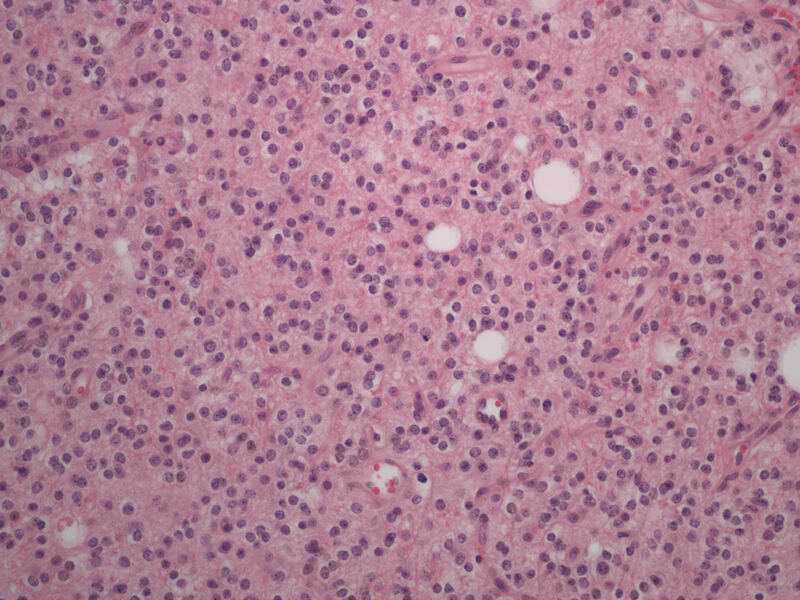 Subependymoma: H&E stain, 100X magnification.